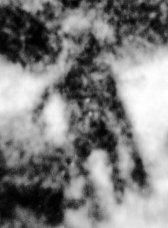 UFOSeek Forum • View topic - Alien from Ilkley Moor case solved? Post subject: Alien from Ilkley Moor case solved? Something strange was in these legs, and what i realized is crouch female, see light and shadow of bend legs. Ok but this guy tell in hypnose that aliens was short. Well i think he return to home and was so excited about that encounter that later have weird dreams about, and under hypnose he tell story about dream, not reality, about something what he believed and not what happend. So i think is crouch woman in dust, which probably want piss behind rock and when see folk in camera wave arm for him to get away, then become afraid and escape. Its probably that simple explanation. And why she look like alien? Its optic illusion, artifacts and distortions. BTW just have that thought if aliens in fact have long arms like monkey then are behind us in evolution which is impossible for them to build ufos. Well it could be also crouch alien trying hide behind rock. I dont known maybe that theory about elves may be correct, strange creatures from medieval fairy tales could be aliens. Post subject: Re: Alien from Ilkley Moor case solved? so a lady squating in the middle of f-ing no where is the expanation? Am only resize x3 original picture and drawn lines where lights and shadow are visible, so this is not my imagination or distortion ilusions. You can clearly see that is asian woman with purse. Here is new full reconstructions. Going back hundreds of years ago, the words alien and extraterrestrial didn't exist. But ET continued anyhow, so ET is described, by all recored historical cultures, in fact.....but they just used different words to describe ET & their activites. Especially in medieval times, many people were talking about demon possesion, demon abduction & demon harassment. Of course if ET pops by an pays you a visit back in Medieval times, you are gonna be hard pushed to understand what an alien is. So they thought it was demon. But think about it, it would be hard, wouldn't it? You have no comprehension of space travel, the stars or other life forms. And this person is standing over your bed looking at you and he or she doesn't look anything like you. To them, a demon would seem like a logical conclusion, the only conclusion in fact. If you want a good contact story from the olden days, I suggest checking out Muhammad's night journey to Heaven, from the Islamic traditon. A full blown trip to the stars with ET, and bedside pick up & return. Thanks, Caper. Often times relevant information comes from unusual materials, such as Holy Books. In medieval peoples thought that earth is flat, they was stupid and thier demon visions have no science meaning. True, they did believe the earth was flat, but I wouldn't say they were stupid. But you have to wonder where they got this idea from. People who lived thousands of years before them knew that the earth was round and knew of all of the planets in the solar system, and the people who made the maps whicj Piri Reis sourced off. So the ancients knew that the earth was round and knew about the solar system, etc. So I have no idea how the medieval people came to think the earth was flat. None at all. Knowledge is usally passed on, either written or orally, or even throuh hear-say. But it seems there was a knowledge blackout, either purposefully or accidental. That's all I know really. There is no doubt there is a deliberate plan to distort and hide true knowledge (which continues to this day), and this may have been the start of, or at least near the beginning, of this plan to hide the wonders and secrets of the ancients. On the other hand, the knowledge could have been lost due to upheavals and cataclysms, etc. Indeed Tweaked, lots of cool stuff in ancient and religious texts. In medieval was no medicine and peoples fear about plague which could kill half town in one month, and probably imagine evil spirits as responsible for that, devils imagination come from fear about something. In present days we have fear about threat from space thats why we could add aliens to our imagination. It is possible that true alien look like nothing we known, for example flying rod. Who known maybe exist earth life forms which are able to live in space, for example some flying medusa which drink water from clouds and absorb sun energy like plants. BTW i made new reconstruction, and well dark skin blonde asian is uncommon, she remind me fantasy "Drow" dark elf. It could be ultimate race hybrid: black asian with nordic hairs. But its probably just some woman in dust and photo distortions.